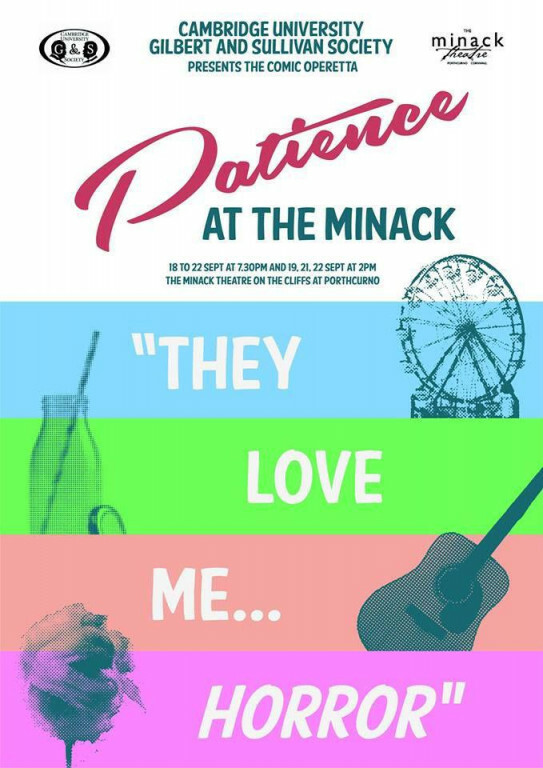 It is with great excitement we can announce that our 2017 show at the Minack Theatre will be Patience! Last performed at the Minack in 2001, Patience is a frothy musical romp, combining a sparkling score, a delightful gallery of characters and the beautiful evocation of a bygone medieval neverland where damsels swooned and sighed for their sweethearts, and where love could turn the world upside-down! Patience, or Bunthorne's Bride, satirizes the aesthetic craze of the 1870's and '80s, when the output of poets, composers, painters and designers of all kinds was, some argued, rather empty and self-indulgent. This artistic movement was so popular, and so easy to ridicule, that it made Patience a big hit. All the well-born young ladies in the village are rapturously caught up in aestheticism, and in love with two contrasting aesthetic poets. But the poets are both in love with Patience, the simple village milkmaid, who cares nothing for poetry. The girls' military suitors don't see the point to aesthetics, but they decide to give it a try to win the women's hearts. It is touch and go for awhile, but everyone ends up with a suitable partner, even if it is only a tulip or lily! If you are interested in being in the orchestra, please email Lucy at patience.musicaldirector@gmail.com with your instrument, evidence of ability and previous experience.